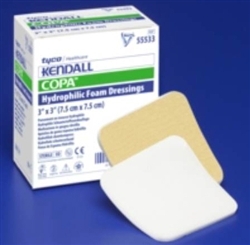 Kendall™ Copa Foam Island Dressing is an ultra-soft hydrophilic foam that protects and cushions wounds. Small pores decrease the chance of tissue migration into the foam dressing. A gentle adhesive allows for a secure fit to help protect and cushion the wound site.